This morning I looked at it … a beautiful, new, stainless steel, Black and Decker toaster. Yes, it was lovely. Yes, my toast was perfect. Yes, it worked like a charm, so what was my problem? I wanted my old toaster. My old toaster was white. My old toaster was twenty years old. My old toaster didn’t work on one side, burned my toast, and blue sparks were continuously shooting out from it when I unplugged it. BUT … I was used to my old toaster! The old white, wrecked and ruined toaster was all I knew. It was what I used day after day. I knew how to make it work. I wanted my old toaster. But, my old toaster didn’t work, was dangerous, and did I mention … made my life miserable! How many times in our lives do we want to keep what’s not working or what could potentially be harmful to our lives, just because we are used to it? I think about my own life and remember the days, some fifteen years ago, when I was in an abusive relationship. I seemed to have adjusted and gotten used to it. I didn’t realize how toxic it was for me and for my children, until it was gone, and something new and beautiful (Farmer Dean) came into the picture. It’s connected to the old adage, “You can’t see the forest through the trees.” We become so adjusted to something that doesn’t work, doesn’t fit, isn’t good for us, and is broken, and yet, we still embrace it and want to keep it. But why? Last week, I went through my closet and found myself doing the same thing that I did with the old toaster. I couldn’t get rid of the old sweater from college, because I loved it. Nevermind that it stopped fitting me about ten years ago. I clutched the pair of hiking boots that had a big hole in the heel, while I quickly pulled the old Ralph Lauren sweatshirt over my head that had a big hole in the sleeve. Why did I want to keep the broken, the wrecked, and the ruined? I have a new pair of boots and a fabulous sweatshirt. Why keep the old wrecked items? What are you holding onto today? Are you embracing things from your past that are no longer in working order? Are you clutching an attitude of “this is all I know,” so you continue to walk out a bad habit? What is it today that you need to let go of, move on, and walk away from? Perhaps this blog finds you like me. Perhaps you are stuck at a place in your life where it’s comfortable, even though the sparks are flying and you feel burned. Maybe you feel stuck with weight gain, or a job that isn’t suited to bringing out your talents, or you are holding a grudge against that person who hurt you five years ago. Today, you may find yourself pulled into that same old habit. Maybe you take your Sunday afternoon to work because it’s all you know, when instead, you could be doing something fun and filling with your family. Maybe you avoid that phone call because you’re still mad at that sibling that hurt you years ago. Habits, jobs, relationships, attitudes, can all become entwined with being stuck in life. Don’t be drawn to the old, broken ways. God is the God of making all things new. He wants the very best for you and for me. Let’s find that best. 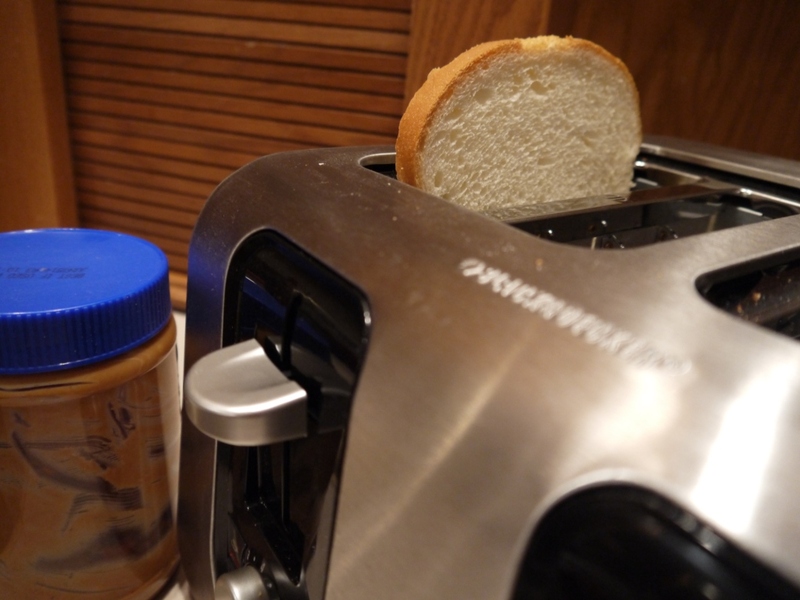 Let’s throw out that old toaster and have a beautifully, golden piece of toast … with peanut butter. No sparks flying makes it all the more enjoyable.